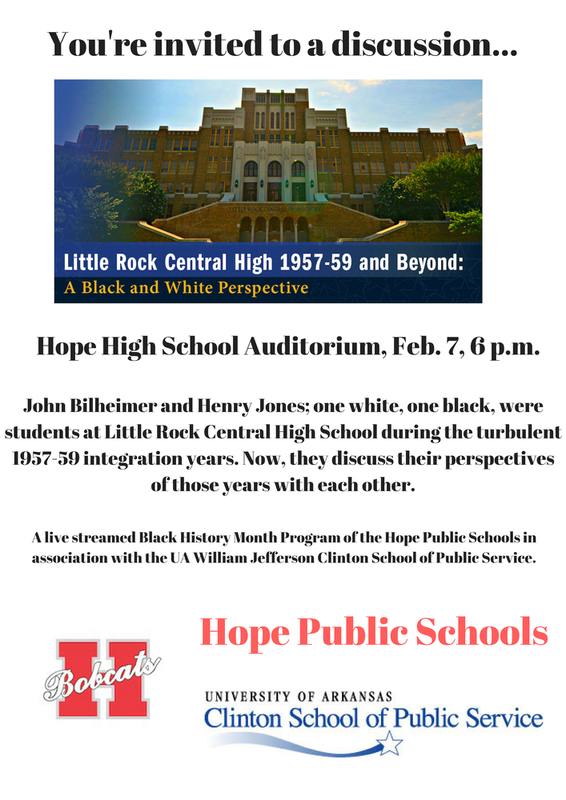 HOPE – A documentary discussion between two men who were students at Little Rock Central High School during the 1957-1959 integration crisis will be presented by the Hope Public Schools on Feb. 7 at 6 p.m. in the Hope High School auditorium. Livestream of the documentary “Little Rock Central High 1957-59 and Beyond: A Black and White Perspective” is an HPS Black History Month program, and is free and open to the public, Hope Schools Superintendent Dr. Bobby Hart said. “As part of our partnership with the University of Arkansas Clinton School of Public Service, they are affording us a great opportunity to present this to the community,” Dr. Hart said. He said the documentary represents the perspectives of John Bilheimer, who is white, and Henry Jones, who is black, concerning the turbulent period of racial integration in Little Rock’s public schools. “It is based upon a conversation between these two gentlemen who had tremendous difficulty, and have grown to understand the times and environments have changed,” Hart said. Bilheimer graduated from the University of Arkansas and Harvard Law School after high school, and Jones studied at Yale University and the University of Michigan Law School. The two LR Central graduates later reconnected as men when they were employed by the first integrated law firm in Arkansas, according to the Clinton School web site. Hart said the conversation between the two men is “interesting,” and it serves as a learning opportunity for students and families in the greater Hope community. “I think we’ve come a long way as a society regarding race relations, but we can still learn from the past to guard the future,” he said.